This service is an HTML5 hybrid web application. It has been optimized for use with the latest version of Google Chrome and Firefox browsers. It is not designed to be compatible with Internet Explorer, Safari or Opera. This is also a beta build and not the final version, so please bear that in mind. There are many more features we intend to add. We will also report outages and other issues using our Twitter and Facebook Page. Feel free to leave us feedback using this form. Account Creation: To create a Martell TV account you must be logged into an existing Google Account that has a Youtube channel associated with it. Currently, you will need a beta key to complete registration of an account on Martell TV, using the Sign-in button. This restriction will be removed once our closed beta phase ends. 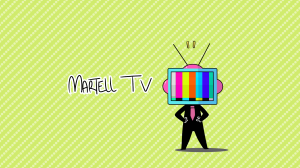 If you don’t have a beta key but would like to watch shows using Martell TV, you can still do so. An account is not required to watch videos using Martell TV. To sign up for our closed beta and receive a code to register an account, please click here. Video Player: Martell TV’s video player has been designed to function similar to Youtube’s video player. While in full screen mode, you may hit the “ESC” key to exit full screen watching and return to the TV Guide. You may also click on the ‘Playlist’ icon at the bottom right hand of the video player while in full screen mode to bring up a list of videos on that station. Timeline navigation: The TV Guide is currently set for Central Standard Time (CST). Clicking on any show using your mouse will load that show. Using the scroll-bar at the bottom of the TV Guide, or clicking on the edges of the screen, you may move down the timeline for the day’s schedule. 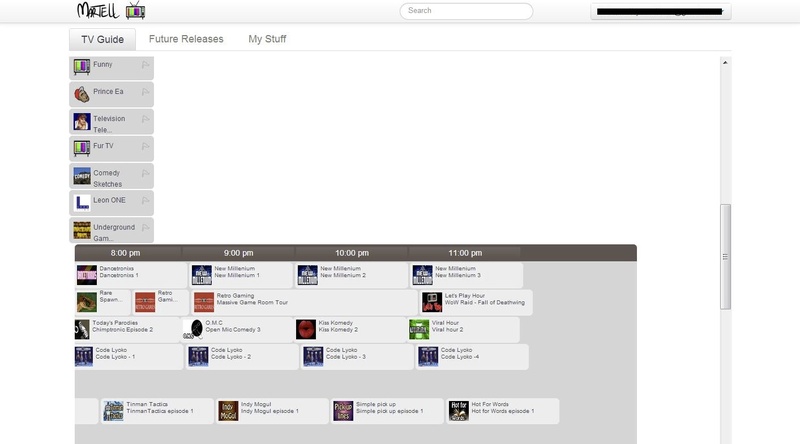 You currently cannot see the next day’s schedule, unless you use the ‘Future Releases’ page to do so. Episode Container: Please watch the below Youtube video tutorial on how to use this feature. Also keep in mind you can copy and paste any Youtube URL into the search field of the episode container to bring up that Youtube video. You can also click on the titles of listed Youtube videos to see them in a preview window. Also remember that you will need to ‘Save’ and then ‘Publish’ your episode before it will go live. Youtube true-view ads do not load. This is not a restriction on our end; Youtube still needs to approve our application for displaying ads. Videos segments in an episode not loading: Occasionally, some video segments don’t load and are skipped by our video player. This appears to be an issue with Youtube’s API and video permissions, but we are looking to fix it. Videos loading slowly: Occasionally, a video does not load instantly, and the ‘loading swivel’ circle appears for a long time. If you simply move your mouse and click anywhere on the video timebar (such as the 0:01 mark) the video will instantly load. This ‘stalled loading’ issue seems to be an issue with Youtube’s servers and is out of our control. Google 414 error: This message appears when trying to click on a show episode when too many videos have been added to a station’s daily schedule. Due to current limits with Youtube’s API quota usage, Martell TV cannot request a station lineup that exceeds 50-60 videos. While creating episodes for your day schedule, please do not exceed video limits. We are currently developing a work-around solution to this problem. TV Guide Array Not Aligned: The problem occurs with users who have their browser ‘View’ not set to ‘Actual Size / 100%’ or possibly have their Desktop settings improperly setup for the size of monitor they have. The problem looks like the image below, and can be fixed by having your View settings displayed correctly for the monitor you have. If you see this, fix your ‘View’ settings to ‘Actual Size’, or correct your monitor settings. If you are an independent creator who would like to join our partner program and have your videos listed in the ‘Martell’ brand stations (Martell Music, Martell Games, etc), please see this page, Become a Youtube Partner with Martell Bros. for details. © 2019 Martell TV : Youtube TV Guide. All rights reserved. Proudly designed by Theme Junkie.